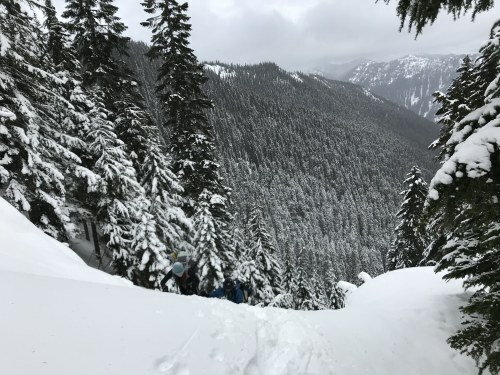 Good snow conditions made for a successful winter scramble on a low-to-moderate avalanche risk day. Very pleasant trip! From the Stevens Pass Nordic Center the path to Lanham Lake is very thoroughly packed down and firm, so aside from a few points where we post-holed snowshoes aren't really needed and will only slow you down. 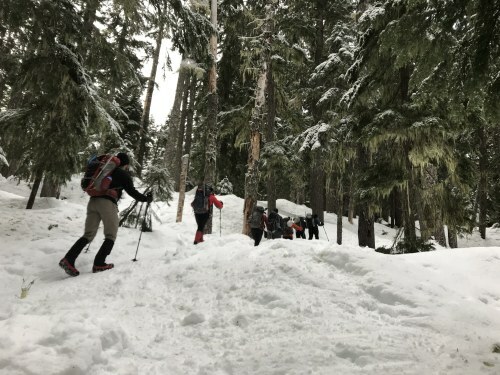 Microspikes are a must though since some of the hard-packed snow has become icy and the trail is hillocky and can be steep for brief stretches. 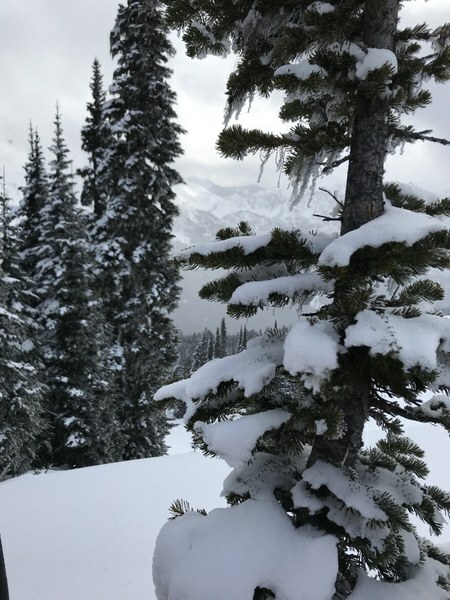 Wear snowshoes if you don't have microspikes just for the traction -- or if you wish to wander through the trees off the (literally!) beaten path. Just be aware of the creek flowing to your left as you head south towards the lake, and that all the lumps and bumps in the snow may very well conceal obstacles or cavities. The scramble route to the peak named Sam Hill by the Mountaineers (which must be unique to the club since I don't see it labelled as Sam Hill elsewhere) does pass through avalanche terrain. One of the most difficult stretches was a steep gully we ascended- shown below. 30-40 degree slope, according to my GPS device. 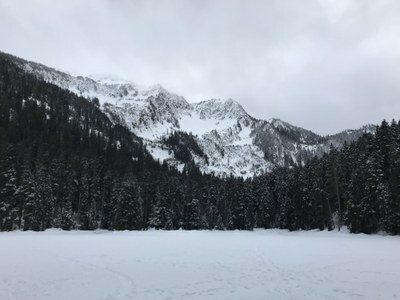 We visited Lanham Lake, then went beyond it on snowshoes to scramble up a peak (elevation 5,938 feet) which the Mountaineers club calls "Sam Hill", west and slightly south of Jim Hill Mountain. At the lake's edge there is an open space with firm trodden snow where many people have paused to enjoy the view. Tracks leading around the west side of the lake appear to be on solid ground. 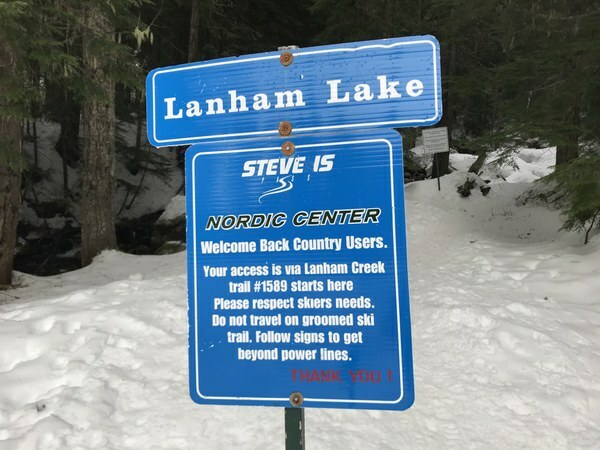 However, as you near the southern tip of the lake where Lanham Creek feeds the lake, you are very likely on at least one snow bridge and/or snow-covered log. Proceed with care. Veer east and cross over Lanham Creek if you wish to explore some fairly flat, snowy ground dotted with trees. We saw a pair of folks winter camping here. We pushed on further for our winter scramble. Beautiful open basin south of the lake, followed by some open slopes (avalanche-prone obviously -- I noted avalanche debris covered with a fresh dusting of snow). A "bench" that was a false summit at the head of a steep gully we climbed up was followed by a gradual climb to the 5800' ridgeline. We then climbed the final knob to summit Sam Hill. Intermittent light snow, cloudy skies, but a great day!